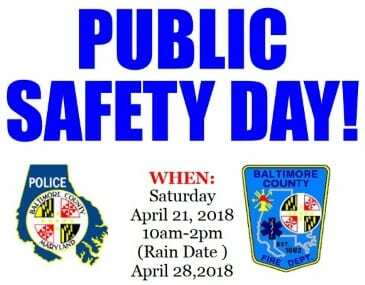 Spring has arrived and Baltimore County Police and Fire Departments, under the sponsorship of the Police Community Relations Councils, are happy to celebrate Public Safety Day 2018. The event will take place on Saturday, April 21, from 10 a.m. to 2 p.m. at Chesapeake Park Plaza, 2333 Eastern Boulevard in Middle River across from Martin State Airport. Attendees will see demonstrations from the BCoPD Aviation Units, Marine Unit, Tactical, and K-9. The BCoFD will have engines, trucks, and medic units as well as a rescue demonstration by volunteer firefighters. The firefighters will show attendees the special equipment needed to extricate victims from car crashes. This year will feature a historical-classic-import car show. There will be prizes awarded to the winners. In the event of rain, Public Safety Day will be moved to Saturday, April 28. For more information, view the Public Safety Day PDF here.